Welcome to November’s issue of Synchronized Chaos Magazine! Happy Thanksgiving to our North American readers, and happy fall, or spring, for everyone everywhere. This month brought in highly developed, specific, and very individual submissions, centered on researching and remembering the past to carry it forward, study it, or reinterpret it somehow through art. This emphasis fits with the holiday concept of thanksgiving – reflecting upon one’s history and one’s heritage, the gifts and sorrows of the past which shape our lives and cultures today. San Francisco multimedia artist Sally Larsen compiles and curates photography of Native Americans, and serendipitously came across manifestations of the unique German aesthetic and thus focused her anthology on the Germans. Her work reviews the confluence of cultures which came about during the period of exploration/colonization a few centuries ago when Europeans first arrived in the Americas, and draws upon new software technologies to critically re-examine much older photography. Painter and bullfighter Kate Leffler also delves into the wealth of centuries of tuaromachia – the courage, passion, and pageantry enacting humans’ struggle to survive and assert our identity against the wilderness. She let me know that the statement, the concept, the memory of humans’ past contests against the land, wild animals, etc was the critical element of a bullfight. 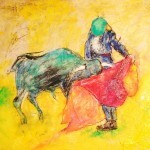 Nowadays, one does not have to kill the bull to make that assertion, but during the ceremony one allows oneself to remember and re-connect with one’s own vulnerability and the Romantic, tragic contest with external forces. 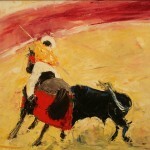 Leffler’s personal bullfights serve as artistic research, informing her current paintings. In the same way, returning poet Danielle Searby highlights the journey of aging, philosophical when happening to others and personal when one becomes older oneself. Searby examines physical change as one’s body ages: people still undergo the helplessness of surgery and age, the modern ‘bulls’ of our time. Essayist and short fiction author Cynthia Lamanna also draws upon the past in her essay memorializing her Italian immigrant grandmother, yet her modern adult perspective also informs the piece, as she knew her while she was a child, but now speculates on the grown-up concerns her grandmother may have experienced. Grandma Littier moved across the Atlantic while very young as a new bride, and worked hard to care for her family and her sick husband when older, and likely experienced a mix of feelings which Lamanna can now understand. The Pennsylvania State University crew working on the upcoming independent film Determinism combine older influences, such as other notable crime-drama filmmakers, but produce their own unique product. Their work depicts a South Asian college student who robs a drug dealer while trying to find the cash to escape the expected hardworking, straight-A, humble, ‘geek’ lifestyle. Can he, and how far will he go, to change the destiny his family and culture have planned for him? Does he control his future, or does his past inevitably shape who he’ll become? Returning author Patsy Ledbetter also deals with issues of choice as related to memory and the past, but in a positive sense. In her vignette, she chooses to remember her religious heritage every time she passes a certain random roadside sight, tennis shoes tied to telephone wires. Her second piece relates how she decided to stay open to learning from people who communicated differently: children with limited hearing and sight. She discovered ways to reach out to young Tori and Mateo by paying attention to how they communicated over time. Ledbetter’s submissions remind us to take time to learn from others, to notice others, to think through what we encounter in daily life. Through this careful listening to the world around us, we can learn enough to begin to communicate with others so they can understand us. WordsFirst/Solo Sundays, the new-ish San Francisco solo performance theater events, make use of communication much more than some people expect from a single person on stage. Actors and actresses develop work as a group effort, building ideas and humor off of each other, and then engage the audience, so each show becomes an individual event. Many WordsFirst performers reference and remember the past, notably Julia Jackson, imagining herself in the place of the mother of a woman about to give a child up for adoption, and another performer, meeting his husband online in the days of early dialup modems. As we remember the past, we speak of the past, and acknowledge and experience anew how it has inspired and informed our present, and likely our future. Whether our pasts are something to celebrate overcoming, something to heal from, or something to gratefully celebrate for Thanksgiving, they represent a source of creative material, as shown by our November Synchronized Chaos artists. Imagine a cast of hundreds, spanning decades, all emerging from the heart, soul, and vision of one spoken word stage performer. San Francisco’s solo series, WordsFirst and Solo Sundays, draw upon real-life material, sometimes performers’ actual lives, to create a blend of storytelling, stand-up humor, and offbeat social commentary, dazzling plenty of unexpecting audience members. Last October’s lineup showcased a gay man’s tale of how he met his husband online, years ago with old 56K dialup modems and America Online CDs. “My Nichiren Buddhist temple’s full of my favorite people. Jews!” he exclaimed. A real-life adoptive mother next took the stage, and she had developed a monologue from the hypothetical point of view of a baby’s birth parents. The lineup concluded with other characters’ reflections: a successful San Francisco Pakistani immigrant businessman returning to his native land to help with earthquake relief, and a Shakespearean actor turning to a Hendrix-inspired rockstar lifestyle through standup comedy to drown out childhood demons. “If there’s ever a race riot in this country, what am I supposed to do? Start kicking my own rear end?” performer David Moss asked the audience. His character, a mixed-race child of divorce and dislocation, took refuge through various forms of performance and provided the audience with a chance to vicariously do the same. Solo Sundays/WordsFirst are not your mother’s cultural lectures, as performers know how to engage and feed off of changing audience energy, and use the entire stage space for drama performance rather than simply speaking to crowds. At times I felt I were watching a stage play with a complete cast, and forgot the solo nature of the pieces. Solo Sundays/Words First are also not your college son or daughter’s drunken poetry slams. Performers develop pieces through months of intensive group workshops and professional level education and critique. Producer Bruce Pachtman says, “Solo performance is a collaborative art from beginning to end and those who don’t develop work with others tend to suffer for that reason.” Producer Kamau Bell effusively thanked another performer during October’s show, explaining that his own spoken word piece would not exist in its current form without Moss’ help. Also, many of the presentations speak to larger societal issues, including race and cultural relations, family and intergenerational tensions, and how economic upheaval affects people’s creativity and well-being. Performers think through the larger context of their monologues, and make audiences reconsider their own cultural assumptions while empathizing with various characters. Of the several shows I’ve attended, I found myself identifying most with a character on paper very different from myself: an Iranian Muslim junior high student sorting out family, religious, and cultural pressures. The woman presenting that piece knew how to feed off of audience energy and tap into universal human concerns about growing up, starting a new school, and being different – and the show left me at once more educated about Iranian immigrants and better able to put my own junior high memories in perspective. Every show, and every performer, I’ve watched through WordsFirst/Solo Sundays generated that type of positive, cathartic, entertaining audience energy, and, best of all, seemed extremely supportive of each other and of everyone involved. I’d encourage others to come on out and enjoy the show, and join in the San Francisco resurgence of an art form which probably has its roots in the distinguished Beatnik and jazz cabaret history. Solo Sundays takes place the last Sunday night of every month, 7pm at SF’s StageWerx theater near Union Square…and Synchronized Chaos readers can get free promotional tickets. WordsFirst is the first Wednesday of every month, 7:30 to 9:30, Counterpulse Theater, 1310 Mission in SF. Determinism, an upcoming independent crime-drama film created by Pennsylvania State University’s Ranjit and Sanju Majumdar and New York’s Lynda Hansen, promises ‘gritty drama,’ and ‘suspense, action, and a lesson’ in the words of YouTube’s viewers. The story concerns a South Asian undergraduate, grappling with loneliness, his family’s financial problems, heartbreak, and cultural pressure to stay a perfect, quiet, geeky straight-A student. Will a onetime robbery of a local drug dealer provide the cash he needs to escape his neighborhood and his seemingly societally determined lifestyle? Dim-light ‘film noir’ techniques set the mood for this piece, which promises to thrill viewers in the moment, but inspire them to think afterwards. The directors began casting with people they knew, fellow Pennsylvania State students, and personally respond to comments from Facebook and YouTube fans. After a monumental effort while the Majumdar brothers still attended school full-time, they recently completed filming and just finished a trailer as part of publicity efforts. Synchronized Chaos has requested review copies of this film, and in the meantime, here’s a link to the trailer. Lamanna’s piece shares her recollections and observations of her Italian immigrant grandmother, who possessed a kind, loyal heart but a fiery personality. Grandma Jenny Lyn Isabella; She was/is my beloved Grandmother, that I recall only in the misty early and part of middle childhood (she passed away when I was in my early teens); she slipped away from this world too young, in a veil of unanswered questions, resignation, and sadness, a faded beauty, slipping away before her time; she loved with the guilelessness of a child, and lived for her children’s dreams, and successes. She lit candles in the dark cathedrals. To her children, sisters, brothers, and in-laws, she was a lunar eclipse, and one in a million, with a beautiful smile shining like a rainbow through her soul’s darkest interludes. By her later mid years, some of the spark and color of life had faded and drained out of her, and on the surface, she appeared a hollowed out version of the fully alive woman who loved so deeply, and would always be loved in return. In an inner battle between angels and demons she was sweet faced and volcanic-like; She would give her last loaf of bread, or harbor a refugee in an instant, but don’t cross her, or be stupid enough to downgrade her family, or shun her gift of love and good will. Without proper nutrition, and dental care, some of her teeth were worn down to little dark pebbles, and some were removed. Still, she was radiant. In my earlier childhood, whenever my Mother told me that she and Grandpa would be coming for a visit, there would be a rejoicing. I would feel it all over, like a tingling of great joy, and I remember taking my sister by the hand whirling around with her in a frenzied circle dance and singing a little ditty I made up, (at the age of four). She would come and always with great adoration, and elfin mischievous joy would bestow upon us a little toy or treasure, retrieved from her full suitcase. It could be a dusted vintage toy from the past or an orange fruited candy; to see the look on her face was priceless. It didn’t much matter to us what it was, for it was she herself our hearts yearned for and longed to see. As time went by, her visits grew fewer and farther between. For our lavish Christmas Eve traditions, usually in the home of my godmother-Aunt Julie-Ann, she was there celebrating with us, somewhere in the shadows, and light; still looming a large presence even in later childhood, when I don’t remember seeing her in visible form anymore. – thin ankles looked thick. the lies of age and I hear a snicker behind my back. I used to enjoy that snicker now it is a poison bullet. and the dreams they promised to prepare. I used to be fire. Am I part of the exclusivity now? There never will be til the day I die. My lips are always painted but the colour has changed. My pretty bones- milky white and raised. How easy it was to return to default. When imagination comes to a grinding halt. No one said you wake me from my dream. Xerox faces staring back at me. Chrome reflections morph the truth. Scientists promise the fountain of youth. Surgical steel and a rubber glove. Bright lights grant halos from above. Rushed into the quiet room. The cleanliness of comatose doom. From the world of plastic. Copied expressions and stretched elastic. White light and humming to calm the mind. Lobotomies and pleasantries strangle mankind. Danielle Searby may be reached at violetpixie@optusnet.au and welcomes comments and feedback. Yesterday I taught blind and deaf children. They inspired me. The blind and deaf He’s given joy. I saw the girl. I heard the boy. They offered a gift. I received…I adored…For my sight and hearing I praise the Lord. I can see His creation and hear His songs. I can sing His praises all day long. Tori and Mateo inspired. Mateo is deaf and has amazing facial expessions. I kept thinking of what it would be like to never hear a symphony or laughter. Oh God, I’m so grateful for my hearing. Tori had just a tiny bit of hearing and vision. She was in constant motion. She never stopped moving all day long. I had such a deep love for her and I barely knew her. I knew it was the love of Jesus. I thank God for these children who have so much to give. For about two years now I have been taking prayer walks around my neighborhood, talking to God and praying. Everytime I walk around the block I notice two old pairs of tennis shoes tied together and hanging on telephone wires not far from my home. Those four shoes have been there through rain, sun, storms and wind. They have been there when I was so inspired with life I thought I would burst. They have been there when I have felt anger, discouragement and despair. Throughout all the ups and downs of life, the tennis shoes have remained in the same place….always hanging and dangling from the wires. God’s love and grace remain the same no matter what the circumstances in our lives and in spite of our human experience. We may call on Him night or day. He will always hear and delight to listen to us. The words we say are often rejected or disregarded by others as unimportant, but our God always wants to listen to us and speak to us through His word, the Bible. Patsy Ledbetter may be reached at patsyled@sbcglobal.net and welcomes comments and feedback. My art is an extension of my forecast into my future using images of the past and present which form my concepts and postulates for the future. 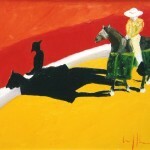 Color and movement are integral parts which I use to weave a tapestry of emotion and passion on my canvas. These are life, these are what makes up my future. Tuaromachia (bullfighting) is a passion that more and more women breaking into and this is a future I paint, I breathe,I live for and execute. 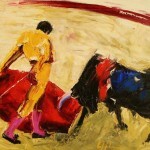 For nothing can emote that passion but the gusano in my blood when I face death, the toro, my art, the color, the passion. I’ve painted for most my life and it has always been a refuge to explore and put into the future what I dream. 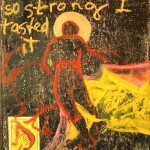 Kate Leffler may be reached at artbravo@earthlink.net and recently exhibited her work at a MySoiree.com event in Berkeley.